AFFORDABLE Calgary and area RV storage prices. 1. Servicing or repair to camping units is prohibited on site. 3. No tampering of other persons campers. 4. No discharge of any camper waste or garbage. 5. Speed limit of 10 kmh through our yard and parking area. 6. Any unpaid dues of over 60 days will be subject to legal action and the removal of that RV from this property. 7. Unpaid RV storage dues of over 60 days will be subject to the sale of the RV to recover outstanding storage fees. 8. 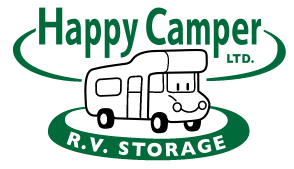 Happy Camper will not be held responsible for any damage which may occur on the premises. It is the RV owner’s responsibility to carry appropriate insurance. 9. No refunds if units are removed from the storage prior to the renewal date. Happy Camper R.V. Storage Ltd. will not be responsible for any damages which may occur on the premises. Please be courteous to our neighbours, and keep your speed to 30kmh between the highway and our storage facility.